If you look closely, you discover that plants can't sit still! Maybe you've seen a plant move - a seedling starting to grow in your garden. You run out to see if the beans have started to grow and there's a green sprout poking out of the soil. Run in for a glass of lemonade, and by the time you've returned something thick is poking out and by the next day there's a seedling, unfolding its leaves. Or maybe you planted some morning glories by the fence and sort of forgot about them - but a few weeks later you notice they've climbed up and over and around. That's plants moving! What I like LOVE about this book: This is such a fun book to read - it makes you want to get up and move around. It validates any kid who's been accused of being unable to sit still.Seriously, if plants - the things rooted into the ground - if they can't sit still, then why should we be expected to? 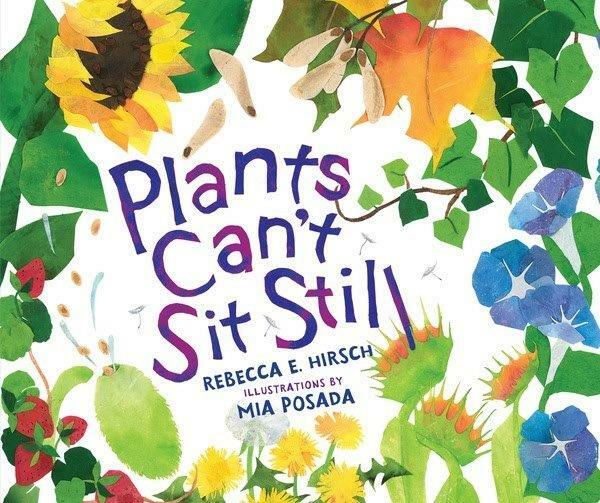 I love the simple, yet accurate, language that Rebecca Hirsch uses to show how plants move - in space, time, and developmental stages. Plants wiggle and squirm, they float and fly, they hitch rides. They definitely don't sit still. I also LOVE the bright, bold watercolor and collage illustrations. Mia Posada's artwork is astounding and brings every page to life. I especially like the Venus Fly Trap. The twining motion of morning glory vines as they seek support for climbing. Investigate the plants living in and around you. Do they move? How would you know if they did? Watch a plant for the week and try to determine whether - and how - it might be moving. Roots? Stem? Leaves? Seeds? Do petals open and close at certain times of the day? Hunt for action words - verbs - that show how plants move. Here's a few to get you started: creep (roots), climb (vines), fold (petals), twirl (maple seeds). Drop by next week for some hands-on plant science activities. 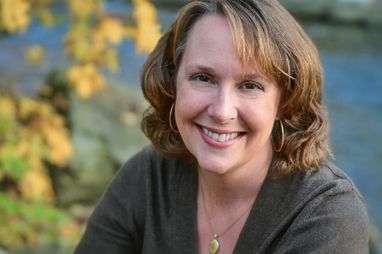 Now for an interview with author, Rebecca Hirsch. I just had to ask Rebecca why she wrote this book, and she graciously answered Three Questions. Archimedes: What inspired this book? Rebecca: (confessing that she became an "accidental" plant biologist in graduate school) Plants are so fascinating. They move in a different time dimension than we move. Many people don't pay attention, but you can see them move. Raspberries, for example - their canes arch and bend down, and where they touch the ground they take root. In that way, the plant moves. One of the cool things I learned in my research was that 200 years ago, scientists were discovering ways that plants were like animals. Even trees have social networks - a "wood-wide web". Archimedes: What sort of research did you do for this book? Rebecca: Observation - I see a lot of this plant movement in my garden, especially the climbers (pole beans, cucumbers) don't stay put. I also read a lot of books and papers by scientists and watched some good time-lapse videos of plant movements (my favorite is watching morning glories send their tendrils out). And I interviewed a scientist doing plant research. Archimedes: What cool new things about plants did you learn while working on this book? Rebecca: I learned so much - too many things to include in a book! So many plants disperse their seeds by exploding. And there are so many ways that climbing plants can climb. Some use leaves or tendrils to wrap around something, and some have glue - a sticky substance exuded by rootlets. And some plants move by floating along in flooding rivers until the water recedes; then they take root. Thank you, Rebecca. You can check out her website here. Today's review is part of the STEM Friday roundup. Drop by STEM Friday blog for more science books and resources. We're also joining PPBF (perfect picture book Friday), an event in which bloggers share great picture books at Susanna Leonard Hill's site. 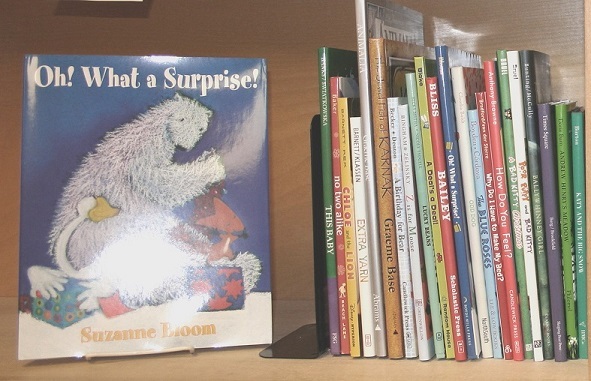 She keeps an ever-growing list of Perfect Picture Books. Review copy from the publisher. This must be a great book, with two reviews today. 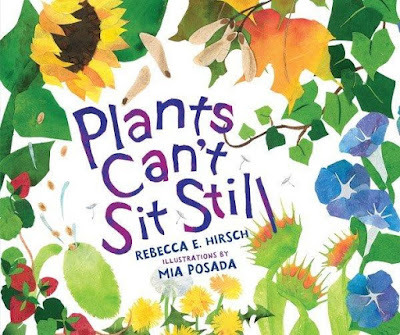 I especially enjoyed the interview with Rebecca and what she thinks about plants. She really makes them interesting for kids. I agree- Rebecca does make science interesting for kids. How wonderful that you included an interview with Rebecca Hirsch! I didn't know about raspberries growning toward the ground and rooting themselves.That explains what happened on the side of our house... I started with one, small raspberry plant and without any eeffort on my part, ten feet of what was once a flower garden has been taken over by raspberries. Thankfully I like pie. I remember being fascinated with plant movement as a child. I used to swivel the flower pots to see the blooms bend toward the sun. Thank you for a wonderful book review and author interview. Thankfully, this is what our black-raz does... otherwise it would die of neglect! Okay, I'm sold! After reading your great review and Kirsten's I will have to check out this book. Your interview with Rebecca is wonderful. I love the idea of a "wood-wide web" and enjoyed learning a few ways plants move. I've experienced the "exploding" method of seed dispersal while weeding my garden! ooh! what exploded in your garden? Here it's a wild geranium. This sounds like a great book to get kids out in the garden! Another I haven't seen yet but have heard about. You will love this book, I'm sure. Sue..it's a great book! And the title is perfect. Wonderful review...as yours always are. My younger son (now almost 40) fondly remembers the huge garden we had when he was a little boy...he loved helping then (I even wrote a pb story about it that is sitting in a drawer)...and he still loves gardening...and is introducing his 3 yr old daughter to raising herbs and tomatoes on their balcony in downtown Chicago. I love the title because I can't sit still either. Sue: I can see why you love this book by Rebecca E. Hirsch. I, too, am certain I will love it also. After all, I love picture books and gardening. The title catches my attention. The illustrations by Mia Posada are beautiful. This Sue thanks you for an excellent review for PPBF and STEM Friday. I love the bold colors in the illustrations. Makes me want to pick up some paints and brushes. Thanks for the review. I've heard of this book but haven't read it. Now I can't wait! Great title.